Skillet is a new spot in Schumacher Place that describes its concept with the whimsical yet seemingly contrary banner "rustic urban food." It is located in the old Schumacher Place Banana Bean location. Essentially, Skillet takes orders at a window a la the neighborhood diner. Much of the menu is designed to be eaten as carry-out, although there is a bit of seating available inside the restaurant. The menu is mainly sandwiches and soups with a limited array of pasta dishes. Vegetarian options on the soft opening menu included truffled grilled cheese, a potato and cheese pierogi sandwich, and vegan pumpkin soup. The grilled cheese was delicately delicious. The brioche and mushroom accents added extra layers of flavor complexity to a dish that is a comfort food staple. The pumpkin soup was prepared with pepitas, or toasted pumpkin seeds, and black beans. The soup had a Southwestern character to it, and it worked very well in the chilly weather. For the soft opening period, Skillet is serving lunch only, although later plans call for brunch and dinner menus following the official grand opening. Prices are reasonable. Since I can walk to Skillet in a minute, I'll be excited to see how the rest of the menu looks when the place gets running at a full head of steam. Hey Thanks Jared! Seems like you hit it right on the head w/ your description! Im glad you enjoyed yourself. 'Till the next time. 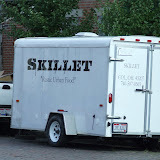 Looks like the weekend brunch is online for Skillet. The pierogi sandwich is damned great. Great blog you got here. I'd like to read a bit more about this topic. Thank you for sharing this material. The weekend brunch menu has vegetarian biscuits and gravy made with cremini and shiitake mushrooms. It is awesome! Hal and Al's is going vegan?